There are some pieces that will flow out of the one-shot and into “Red Hood” as it appears from October’s solicitations Jason will soon be taking a leadership role in the League. I get this sense this comes with the help of the Bronze Tiger, a character that’s appeared in the book in flashback as Ben – a mercenary buddy of Jason Todd. What was your goal in tying the past of those two characters? I wanted to really build up Bronze Tiger as though from scratch. Some of the elements of his history are still in place, but with the New 52, we’re always encouraged to tell these stories in a big, bombastic way for the first time. That’s what I wanted to do with this character who I’ve loved for many, many years. In the stories that most people are familiar with him, he’s already had a change of heart. This is after the Denny O’Neil years where realizes that he was doing the wrong thing for all that time and then joins the Suicide Squad as a means of redemption. He was seeking redemption there and wanted to be a good guy, but when you meet him in our book, he’ll still think he’s doing the right thing in this lifestyle. Jason is looking for some kind of purpose in his life, and Ben has all the answers. He’s a very calming, soothing presence, and he’s been left in charge of things with the League at the moment because he’s the most level-headed of all these very dangerous, mostly insane killers. He’s the guy who can bring everyone together. That’s they dynamic I wanted to play with the two of them: Ben as a mentor figure for Jason. Even if they come at this from very, very different angles. Ben cares a lot about Jason, and back when Jason was working with him, he cared about Ben as well. The other thing people have been talking about is that traditionally Bronze Tiger wore a very realistic mask, but with Brett Booth’s redesign, he seems much more a super powered villain. Is that another big change you wanted to bring to the New 52 version? Yeah. When I started approaching the character, I was very much thinking about him in his classic form. But as we started talking about doing a new take, the way I ended up seeing him was that he was one of the best martial artists in the world before he could transform into a tiger creature. [Laughs] So that just gives him a lot more physical powerful with every punch. With or without the transformation, he’s one of the most dangerous guys in the DCU. 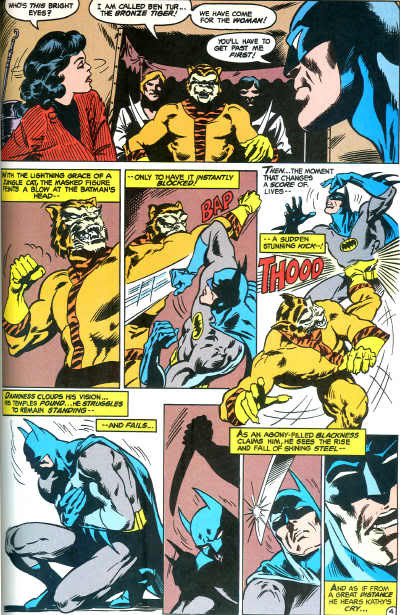 But this adds a little flare and some more intrigue into the process of how he became Bronze Tiger. Those are stories where some will play out in this story and some will play out further on down the line. I hope they did not white wash this character. If he transforms between human and metahuman. Cool. If not he’s a transformed black manimal. Curiously what message does the black manimal send?